Start this cultural tour at either your Acapulco port or hotel. 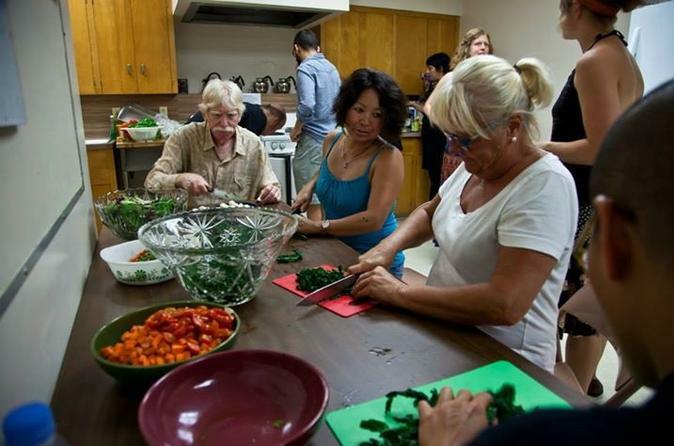 Learn how to create Mexican cuisine and enjoy savoring what you have cooked at a renown Acapulco restaurant during this 4-hour cooking class and market visit led by knowledgeable and fun loving professional tour guides. The small group is limited to just ten cooking enthusiasts. Your professional chef has selected the best of Mexican cuisine for you to enjoy. Learn how to prepare the best guacamole and salsas of variety, a delicious tortilla soup, and the best beef or chicken fajitas. After picking up the necessary ingredients, all fresh, from a local market, prepare your dishes back in the kitchen. Whether it’s tortillas, salsas, soup, take home exciting recipes knowing you’ll be able to easily recreate the flavors of Mexico. After hotel or cruise ship terminal pickup, meet your professional guide and start your tour by walking through the market and choosing the ingredients for a Mexican gourmet lunch, where you will learn to prepare a little later in one of the best Mexican food restaurants. As you explore El Mercado Municipal your knowledgeable tour guide will share with you the origin and history of the local ingredients you see around. After getting all the ingredients for lunch, you will head to the restaurant where you will take part in a lunch cooking class. Here, you will learn about some authentic cooking techniques and then enjoy a delicious lunch right there. This Mexican cuisine tour that highlights local gastronomy, a recognized Immaterial Patrimony of the Humanity by the UNESCO, will give you an insight into local food. Learn tips and recommendations from your knowledgeable guide. Conclude with drop-off at your cruise ship terminal or your hotel lobby.